WE’RE IN DOWNTOWN LOS ANGELES, AT THE CORNER OF KOHLER AND OLYMPIC. We take clients by appointment only so please make sure to schedule an appointment before arriving. For GPS purposes use 875 Kohler Street. Kohler Street is 1 block east of Ceres Ave.
We are behind Munguia Produce – in the back of the parking lot. Our building is GREEN, and there is a big “834” in black above our door. DO NOT USE 834 Ceres Ave for GPS directions. 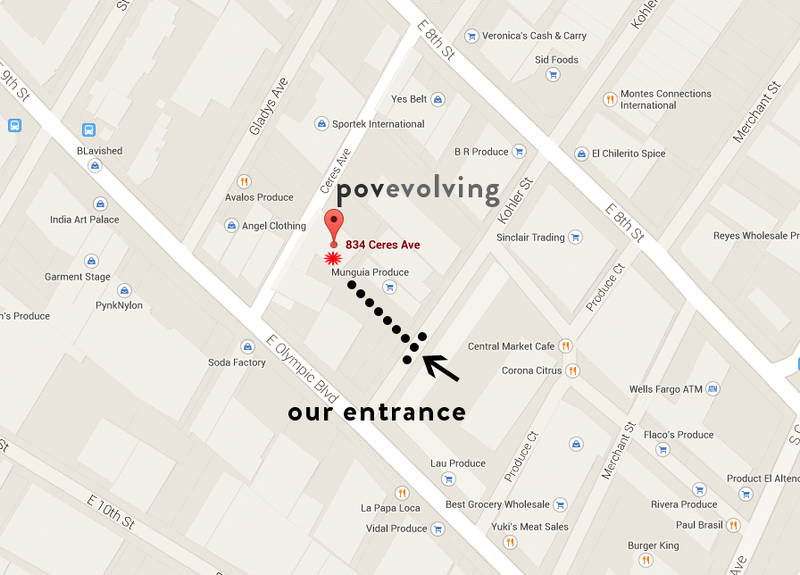 Google maps will take you to a dark alley behind our studio. Please scroll down for a detailed map and parking instructions. Parking: Pull right up to the front of our building, as indicated by the green mark on the map below. Need Driving Directions? Here’s a map. Super close but kinda lost? Click here. Use the Google Maps address for shipping purposes only.